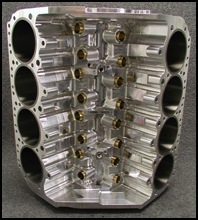 The splay cap block is very popular among Pro Stock and nitrous Pro Modified racers. The splay cap block is a design similar to the stock GM block as the pan rail is slightly raised above cap face. The outer cap bolts are at an angle and reach a very strong area of the block above the pan rail. This design has proven to be very strong and reliable. 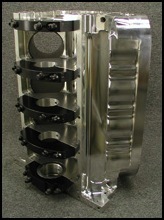 The design allows motor builders to take advantage of new oil control technology. 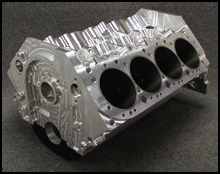 The 5.0” bore space BBC is the best design for big power racing engines. Better cylinder heads, bolt patterns, and push rod geometry are just some of the reasons why this platform is the dominant engine design. We have designs for all the popular cylinder head configurations including - Alan Johnson, CFE, Eicke-Brodix, RFE, Sonny’s GM Hemi and Sonny’s Wedge. CN Blocks offers a variety of block options for the racer requiring a splay cap block.